A hotel for pigs, their owners and, during the day, fans of all things porcine. 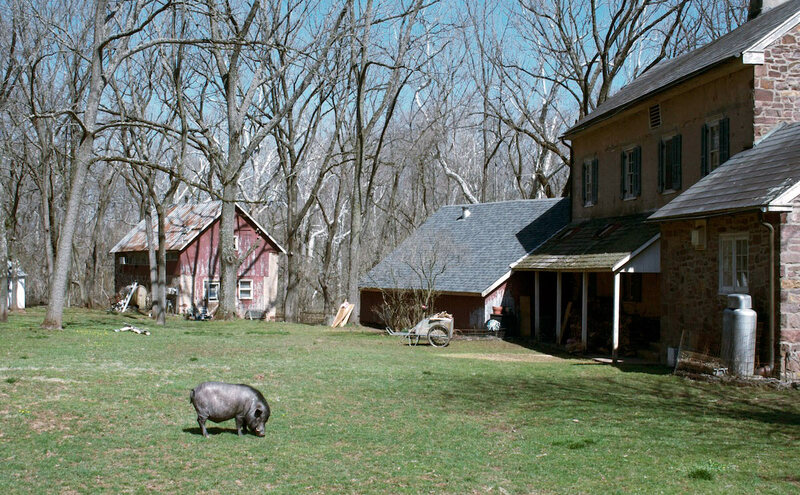 Just two hours from New York City and an hour from Philadelphia, Ross Mill Farm offers a retreat for a very niche audience: pet pigs and their human fans. The spa includes exercise facilities, pools, and private chefs”“”“but that’s just for porcine guests. For bipedal visitors, there’s a small cottage available for rental with a view of friendly pasturing pigs, or you can just drop in between noon and 3 p.m. any day. 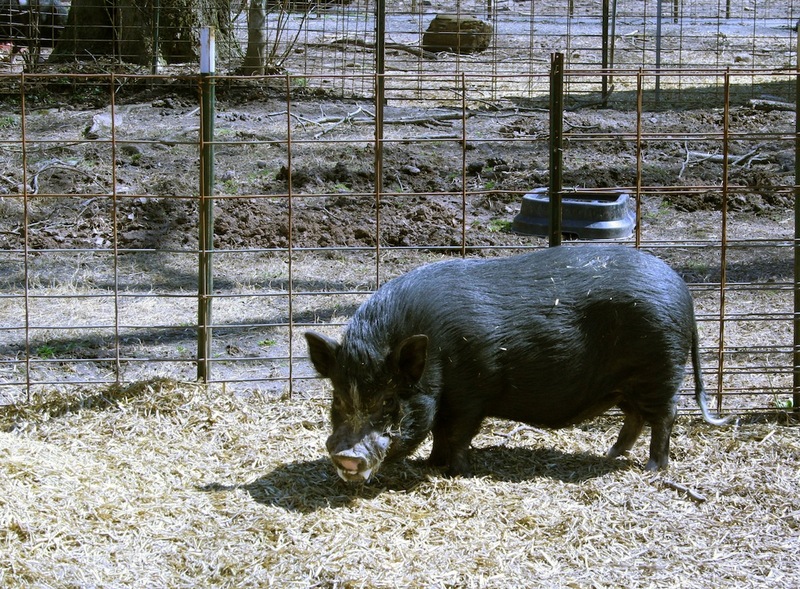 Ross Mill Farm has everything a pig fancier could wish for, from boarding services to specially-formulated feed, and for those of us unable to keep our own pigs, a chance to mingle with them, and perhaps sponsor an orphaned pet in need of foster care. A few years ago, my boyfriend became smitten with the idea of a pet pig. It all started when we were given a plush piglet upon checking into a hotel. “Wouldn’t it be cute to have a real one?” he mused. 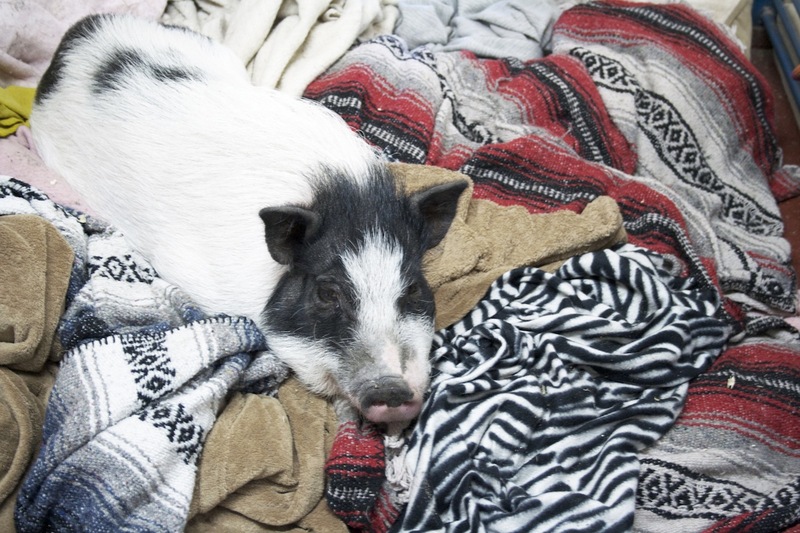 But Brooklyn apartments aren’t conducive to pig-keeping, not least because it is illegal in New York City. Pigs don’t like stairs”“”“in fact, stairs destroy their knees”“”“and the idea of carrying a 50-pound pet up and down from a fourth floor walk-up dampened our enthusiasm. A pig would be much happier on a first floor, with a back yard. We headed to Ross Mill Farm to get our fill of piggy time, without making any rash decisions. Still, at the back of my mind I wondered if we’d fall in love and return with an extra passenger in our car. A pig in a blanket at Ross Mill Farm! At Ross Mill Farm, everywhere you look pigs contentedly nap in the mud, root in the pasture, or snuggle in a pile of blankets in the barn”“”“there are some 100 in all. About a dozen pig-families live in dollhouse-like structures with their own fenced yard. Amongst a scattering of historic farm buildings from the 1700s stands a new barn that looks like a camp lodge. Another 40 pigs live in stalls around its perimeter, and there are special bathing facilities inside, complete with aromatherapy candles and New Age music. Each morning the caretakers let out all the pigs in the lodge to meditate with them. Sara Lee, a large potbellied pig with fat rolls over her eyes and knees, greeted us as we stepped into the lodge. We learned that she was on a weight loss program (she’s doing much better than when she arrived). Standard hog feed is designed to fatten animals as quickly as possible, so it creates health problems for pet pigs, who easily become overweight, with fat rolls hindering their movement and blocking their vision. The farm’s founder, Susan Armstrong Magidson, worked with swine nutritionists at UC Davis to develop a high quality feed (free of preservatives and medications) for potbellied pigs to ensure they feel full and get excellent nutrition. She feeds it to all her charges at Ross Mill Farm, and sells it under the brand name Champion. Private chef services and diet plans are not offered for human guests, but there’s a cute little kitchen in the B&B cottage, with a green and white checked floor and a pig-shaped tea kettle. There’s no lack of pig trinkets and motifs in the decor, and it’s outfitted to be as comfortable as a 1700’s cottage can be. A family of six once inhabited the home and it can still sleep that many people, but by today’s standards, a couple would find it quite cozy. I romantically imagined myself reading a book on the garden bench outside the cottage, gazing at the pigs, then coming in for a home-cooked vegetarian meal beside the antique fireplace. The cottage may be richer in history than in comfort, but where else can you stay on a pet pig farm? Pigs have the run of the place. People usually stay in the bed-and-breakfast for two or three days, but pig guests often stay longer”“”“sometimes indefinitely when circumstanced don’t allow them to go home. They might come for weight loss or behavior modification, or just for “camp” while their owners travel. Edward Snorton was a frequent camper, coming to stay whenever his family went on vacation. When they had to sell their home and move out of state and into an apartment, Ed came to live in the lodge. His family supports him while he gets all the care he needs, and he will likely live out his old age at the farm. We couldn’t help but notice a friendly little black pig with a note on her stall indicating she was available for adoption. The story of Ross Mill Farm is a story of discovering a need and devising a way to meet it. Susan started as a breeder, but quickly got involved with providing whatever services and products she could to improve quality of life for pet pigs and their owners. “What will I do when I go on vacation?” asked her clients, so she offered boarding. “My pig is too big for my car,” they worried, so she started pick-up and delivery service. She designed harnesses to suit the anatomy of pigs because ones for dogs wouldn’t do. She formulated feed and treats for her own pigs, then offered them to customers too. Seeing an enormous need, Susan founded the Pig Placement Network to help find homes for pigs who’s owners got in over their heads. Her reputation as a breeder allows her to redirect prospective pig owners towards adoptable animals, and she’s gotten out of breeding all together. We couldn’t help but notice a friendly little black pig with a note on her stall indicating she was available for adoption. One of the caretakers gave us a head of romaine to feed her. I’m not sure who squealed with delight more as she munched on the leaves, the pig or my boyfriend. But even if we lost our cool and wanted to take her home, we couldn’t. The rules for adoption are strict: you must own your home, you must prove you have access to a veterinarian who can treat potbellied pigs, and your neighborhood zoning must allow them. Three strikes against us. Envious of the luxury the pigs were experiencing in their spa, we opted for a nearby b’n’b with more amenities than the cottage. As we drove away towards our own retreat, we didn’t take any passengers with us, just a lot of cute photos. Pigs are meant to be on a farm and after a day spent in the Four Seasons of pig accommodations, keeping one in an apartment seemed like an even more selfish act. We’re sticking with plush pets for now, but we’ll be back to visit whenever we need a little pig time.